To the best of my knowledge, I've never had tapenade before this, except possibly on top of some bruschetta here and there. It's obviously not a stand-alone item. It needs something bready to be served on. It's more of a condiment than anything else. If Sonia and I had been ambitious, we could have made our own bruschetta by toasting a crusty loaf of French or Italian bread in our oven and adding some olive oil and this tapenade. Or if I had been smart, I would have just picked up the Trader Joe's Pita Bite Crackers that were sitting next to the tapenade on their display, and then I could have made this a double review. BUT, just as I picked up the tapenade, I remembered that we had a big box of Ritz-type crackers that we ate with our Wine Country Chicken Salad slowly going stale on our shelf, and one of the more practical voices in my head told me to just use those up before purchasing any more crackers, knowing full well that the pita bite crackers would be consumed before the Ritz-type ones, thus rendering them even more stale, and risking a bit of food wastage. SO...we put them on the Ritz-type butter crackers. Big mistake. The butteriness of that type of cracker did NOT go well with the pasty, peppery oiliness of the tapenade. For some reason both textures and tastes conflicted a little. Don't get me wrong, it wasn't terrible. It just wasn't the gourmet taste adventure that we discovered shortly thereafter. We satisfied my frugal side by finishing up our butter crackers, and then we ran out to the grocery store next-door and got some Town House brand Pita Crackers with Mediterranean seasoning, and they were a much better match! Despite being full of peppers, the taste of the tapenade was pretty mild. I almost expected it to be salsa-like at first, but it was a delicate, oily, vegetabley flavor. 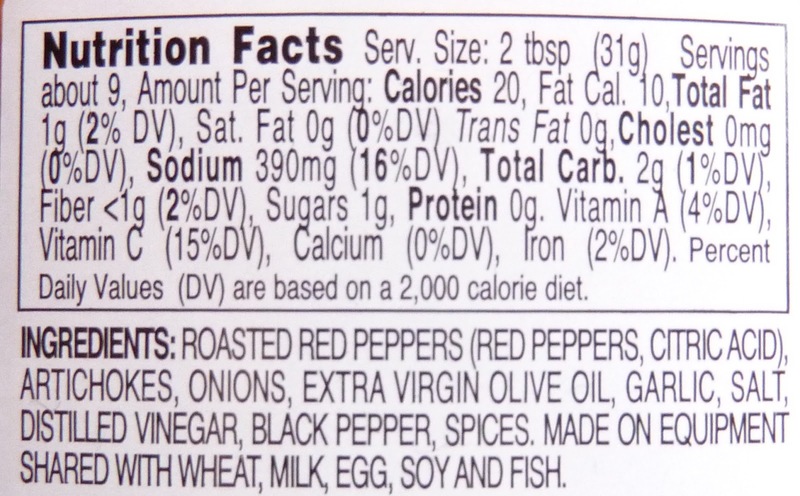 The red peppers gave it just enough zip to keep it interesting. 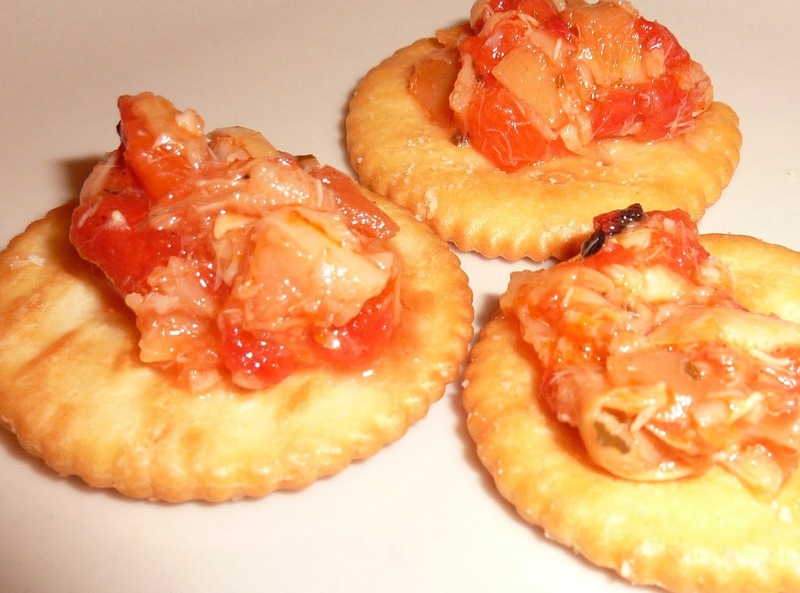 And somehow the herbs in the crackers perfectly complemented the relative subtlety of the tapenade. The dry graininess of pita crackers worked much better texture-wise, too. Sonia and I both agreed we'd never eat tapenade with butter crackers again. So...be sure to stock up for Superbowl Sunday. Because there's nothin' like tapenade...and football...together. 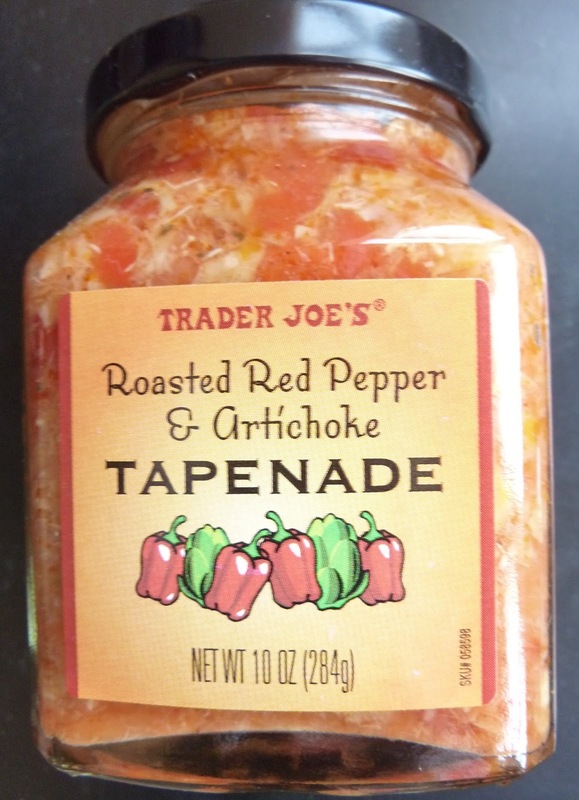 I give the tapenade 4 out of 5 stars. Sonia gives it 3.5.
oh well, live and learn!... yep u needed something more rustic... bet rubbing a cut garlic clove on a toasted baguette would of tasted great. I have always served this over a smear of hummus, on top of the little toasts that TJ's sells. It's a party staple for me. Funny, I don't think I've ever eaten this on a cracker. I mix it in with pasta instead of using sauce. I'll also dollop it on top of a frozen cheese pizza before baking it. I'll have to try it on pizza and pasta next time. Sounds good! I eat this on sandwiches instead of mustard...with or without mayo. Yum!